This interview was conducted by Agency Owner, Mike Rudick. The Rudick Agency is lead by Mike, who gives selflessly each and every day to his team, family, and community. Mike leads by example in Symmetry Financial Group, while working full time as a firefighter. If you're looking for a possible career change, we encourage you to check out his website, watch his corporate overview video, and setup a phone interview to speak to Mike directly about career opportunities at SymmetryPreview.com. Mike Rudick bragged on Whit by letting us know how impact his leadership skills have affected their lives. Whit regularly speaks to multiple mega-church campuses every weekend, with upwards of 10,000 plus members in attendance each week. 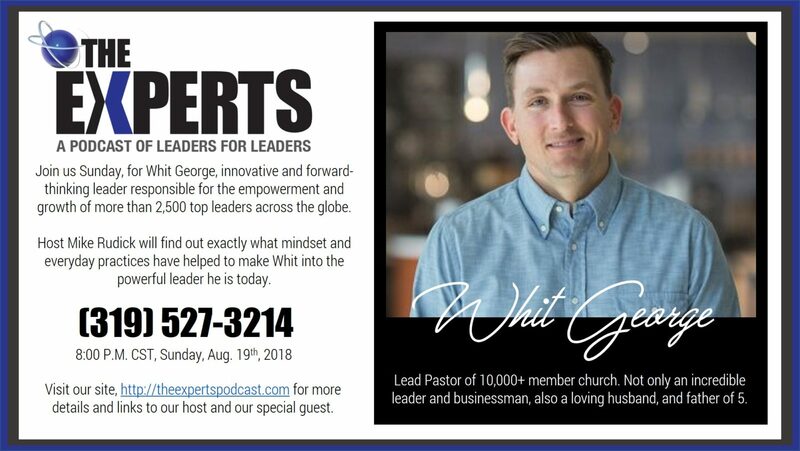 Whit has been the founder and leader of the Seeds church resources site, and Seeds conference, that hosts more than 2500+ leaders from around the world. Whit has a style unlike the others. He has taken the traditions and teachings passed down from generations, and translated it into a language that speaks clearly to people. He is duplicating leaders in his organization who have the special gift to communicate. Whit's advanced leadership is based on his focus to his calling, and his ability to identify his own personal strength and weaknesses. Once we are able to identify that in ourselves, we can begin to help other's identify and live within their strengths. By surrounding yourself with like-minded people, the growth becomes exponential. Whit has successfully transitioned over a 24 year career, from peer, to leader, and remains the foundational building block for other leaders around the world. All of us carry things from the past. It doesnt matter how great your life was or is, there is "junk" each and every one of us carry with us that effects everything we do, and most important, the way we communicate. These are the reasons people cant trust others, why you loose your temper more easily, why people dont see the real you. They keep us from being the people, not only that we want to be, but that we are meant to be. A small group becomes a safe place to sort through things, and find the blind spots. In order to make a life change, the small group can help us to work through and process who we are, and what effects our communication and decision making. The community can help you to gain self awareness that many lack. The Pastor referenced TED talk host, Johann Hari, who spoke on "Everything you think you know about addiction is wrong", and explains exactly how community and addictions are at opposite ends of the spectrum. Whit has provided a community of like-minded people with the tools and guidance they need to turn the past, turn the addictions, into a positive actions and personal growth. The church was never meant to be something you attended, its about being part of a community of people. In order to do that, you have to break it down into small groups. We grow through the relationships with other people. Whit's 24 years on staff started from the bottom, and is the key to his success now. His lack of knowledge and humble openness to learn created a dynamic growth environment. You will have first hand knowledge of what you will be facing. The experience of doing many different positions painted a picture that being put at the top wouldnt be possible. People want to see you earned it, and you want them to know you earned it. Starting at the bottom is a blessing. The natural feelings of moving up in leadership is to be nervous about the relationship you have formed. The only way to overcome, is to own the position you are stepping into. You have 2 options, believe it because you earned it, or believe it is a calling. I was placed there to make a difference and do the best you can do with grace, is a calling. Its ok to question your own ability, but have confidence in the calling. Confidence leads to confidence. When a leader has confidence, it gives confidence to the people they are leading. Whit's daily activity isnt as strucured as he would like. He learns about himself and the world around him by self-meditation, and focusing on self-awareness. Your leadership style has a dark side. Understanding how the dark side of your communication and approach effects the people around you. In the book, "the intangibles of leadership", author Richard A. Davis, discusses self-awareness and understanding the strengths and weaknesses is of the utmost importants and is the only way you will be able to change. Reflect and have perspective on your experiences. In order to grow, you need to know two things. A good leader can easily answer these questions. Where are you going/trying to accomplish. Not only understanding the positives of your self, but also looking at your weaknesses, will help you to lead inside your own wheelhouse. Weaknesses and seeking out feedback can be very difficult and painful for most people, but ultimately leads to your betterment. Watch yourself back, study your mannerisms and delivery. What you think you are projecting, may not be what you are actually projecting. Ask the hard questions to the people who want to see you succeed. They want to praise you, but you must seek out the constructive feedback that helps you see where your perceptions can align with your projections. What is it about the way I work that makes your life harder? What am I involved with that I shouldn't be? Do you think this meeting was effective? What of my responsibilities do you feel like you could handle better? Where do I tend to get defensive? What could I do as a leader to make your job better or easier? Knowing your own unique strengths and weaknesses will allow you to operate and do only the things you can do. Thats how you scale something. Leaders become the lids in their organizations because they are doing jobs that other people should be doing. The more you empower other people, the better things will get. See the incredible people around you, and allow them to grow under your positive self-awareness. Symmetry Financial Group actively seeks personal and professional growth opportunities. GiANT leadership worldwide has provided us with the tools and knowledge we needed to implement the idea of small accountability groups within our large organization. We have seen incredible growth strides in our leaders and teams.